Auntie Anne’s Birthday Giveaway Sweepstakes & IWG – Win free pretzels for a year! Win free Auntie Anne’s pretzels for a year & more! 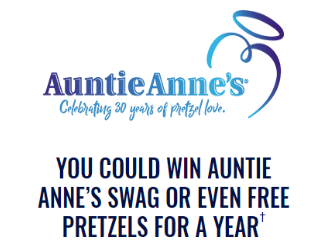 ENTER SWEEPSTAKES HERE – Auntie Anne’s Sweepstakes page. SWEEPSTAKES ENTRY PERIOD – The Promotion begins at 12:00 a.m. Eastern Time (“ET”), June 11, 2018 and ends at 11:59 p.m. ET, August 12, 2018.
redeemable for any pretzel item; not valid at most airport and travel plaza locations); 5 “For the Love of Pretzels” Collection t-shirts, one of each design, all size large; and 1 “Auntie” fanny pack. All prize details determined by Sponsor in its sole discretion. Free Pretzel Card terms, conditions and restrictions apply. Approximate Retail Value (“ARV”): $345. 250 FIRST PRIZES: 1 Free Pretzel Card (redeemable for any pretzel item; not valid at most airport and travel plaza locations) and 1 “For the Love of Pretzels” Collection t-shirt, size large. All prize details determined by Sponsor in its sole discretion. Free Pretzel Card terms, conditions and restrictions apply. ARV: $13.